Successful delivery of precision medicine to lung cancer patients depends on robust biomarkers to define prognosis, determine optimal dose and select patients most likely to benefit. Our Centre has considerable strengths in biomarker science with strong research programmes in tissue, circulating and imaging biomarkers. Clear synergies exist between the Biomarkers and Tumour Heterogeneity and Evolution themes where our biomarker expertise is being deployed within the pioneering TRACERx protocol. Biomarker candidates emanating from our Basic Science and Immunology themes will be developed, validated and qualified via innovative clinical trials led from within the Centre. Our Centre has one of the largest biomarker hubs in the UK run to Good Clinical Practice (GCP), where biomarker data can be used for clinical decision making according to EU regulations for clinical trials. Acknowledging challenges associated with serial lung biopsy, we have developed an extensive portfolio of circulating biomarker assays. These include the enumeration and molecular characterisation of circulating tumour cells (CTCs), sensitive multiplex ELISA panels for angiogenesis and cell death biomarkers and a comprehensive tool kit of approaches to assess circulating nucleic acids (cfDNA and miRNA). CTC profiling using advanced bioinformatics algorithms for single cell analysis will be used to evaluate heterogeneity and discover biomarkers. In parallel, we established unique small cell lung cancer (SCLC) patient CTC derived mouse models – termed CDX – generated at patient presentation and/or at relapse. Our new SCLC mouse models now afford unparalleled opportunity to explore disease biology, interrogate mechanisms of drug resistance, test novel therapeutics (integrating with other Centre themes) and develop tissue, circulating and imaging biomarkers for this disease for which as yet no targeted therapies have made an impact. 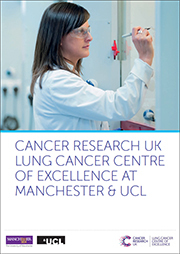 Lung cancer imaging is a major focus within our two aligned CRUK/EPSRC Imaging Centres. Establishing imaging tools to probe the molecular basis of cell-to-cell intra-tumour heterogeneity to complement our genomic studies represents a major step forward and is a goal of the Biomarkers theme. Focussed on druggable receptor tyrosine kinases (e.g. EGFR, c-Met) and associated signalling networks, we are developing advanced biophysical techniques to measure protein-protein interactions (from the less than 10nm through to 200nm separation range by a combination of FLIM histology and superresolution) in tumour biopsies and CTCs from patients pre and post treatment with these targeted therapies. We aim to detect onset of signal transduction ‘rewiring’ processes early such that intervention can occur before drug resistance is fully developed. Tissue imaging based pathway analyses will be coupled to in vivo PET and multi-parametric MR imaging, underpinned by the development of new PET/SPECT tracers, for example against c-Met, that are being developed with our Cancer Research UK/EPSRC Cancer Imaging Centres. We were the first to publish methods for motion corrected DCE-MRI applied to lung imaging, we are leading development of Oxygen Enhanced MRI for imaging the lung and we are exploring the relationships between Diffusion Weighted MRI and drug induced cell death. In summary, the Biomarkers theme will integrate the basic and clinical research within our centre as we strive to improve patient outcomes with hypothesis driven, biomarker guided clinical trials. Chair in Molecular Oncology at the UCL Cancer Institute.